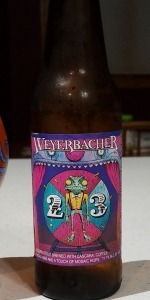 23 | Weyerbacher Brewing Co.
earthy malts, and spicy hops with a touch of astringent booze. warmth along with a lightly spicy hop flavor that gives balance. Overall, a FANTASTIC brew from one of my favorite breweries. Darker amber and mildly hazy. Minor head which fades completely leaving no lacing at all. Dry with a cardboard smell. Some hop and a raw burnt barley nose as well. Boozy, brandy-like start to the taste. This more like a bitter barley wine with a touch of coffee than stout (pale or otherwise). Like the smell, this is very dry. The "stout" flavor comes from the coffee even though it doesn't taste like coffee. Man, it really seems to date both of us when Weyerbacher BC is putting out their 23rd anniversary ale! I will be retired from the U.S. Navy for 20 years at the end of October & I can remember going up to visit them shortly after being discharged. I try to get at least one bottle of their annual anniversary release & although some are better than others, it is always a worthwhile purchase. From the Bottle: "Golden Stout brewed with Cascara, Coffee, Cacao Nibs and a touch of Mosaic Hops". My thanks (congratulations?) to whomever did the add on this beer. It is complete with Notes & an approved pic, allowing me to get on with my tasting & review. It began, as it always does, with the Pop! of the cap & a slow, gentle C-Line pour into the awaiting glass. It led to the quick formation of two-plus fingers of fizzy, foamy, French Vanilla-colored head with modest retention, quickly falling to wisps. Color was solid Amber (SRM = > 7, < 9) with NE-quality clarity, but when one of the first descriptors is the color "Black", it does not bode well for the "Look" score when rating to style & not to taste. Nose was an odd mélange of coffee, tobacco, baker's chocolate & a light booziness. Yeah, when it weighs in at 11.1%, it might be a good tide to bear that in mind throughout. Mouthfeel was big & thick & while it was not overly carbonated, it laid on my tongue like a dollop had been scooped there. Taste was interesting with notes of cherry & blueberry from the Mosaic hops, baker's chocolate, dark-roasted coffee & that sweetish vegetal quality of drying tobacco. Very interesting. Finish was dry, but not gaspingly so. I would be curious to see if I can score another bottle & allow it to age. I'd like to see what develops with it over time. This concoction is interesting. As far as stouts go, I am perhaps missing smoky and roasted flavor. There's deep, sweet, dark fruit flavor, which reminds me of Belgian strong dark ales. I don't want more than one serving at a time, but I do enjoy the serving. Dark Copper colored with a slightly amber tint. There's a fingernail of beige around the rim and covering a quarter of the middle. The nose is a bit odd with the cocoa nibs, coffee, and hops creating a slightly cloying blend of chocolate, hibiscus, and rose hips. The taste is more chocolaty, but the coffee, rose hips, and hibiscus are also there. The mouth is dry and faintly oily. Light coffee with chocolate and light sweet caramel, a coffee finish the lasts a LONG time. I'm not generally a light roast guy but this works with the sweetness. Rather light amber bordering on straw/gold, opaque due to density. Light roast coffee, some chocolate, and lighter malts. This is really really good, kinda surprised how good. I'm really not sure how this one worked out, has a lot of notes I don't like, but that coffee lingering finish and chocolate without the dark stout finish is really working for me. Reasonably well priced at 15 a 4 pack. A: A very muck cadmium orange has abnormally large, and by no means an not an exaggeration, 1/2 inch to 3/4 inch sized floaties that were densely packed. A golden tan capping is creamy and slight, eroding rather quickly. Honestly I love the unfiltered beers, but I never, even in my home brewing days, have seen such large bready chunks in such a large mass gathering. S: Fresh cocoa powder, milky dark chocolate richness is sweet with some dark fruit. French vanilla coffee and caramel creamer, of pretty good awareness and staying power. T: Sweet chocolate is rich and quite deceiving coming from a drink that is golden color in nature. A rustic orange, with rich cocoa, some spicy alcohol warmth shows honey-nutmeg spiciness, with some buter scotch and apple anise. Sweet maple syrup, bread and grains base with some toffee and baked cookies. M: Thick and syrupy mouthful, buttery warmth, honey alcohol notes. O: Overall a nice complex flavor with lots of spicy alcohol and Belgian like spiciness. The large unfiltered chunks may take some back at first, you just have to not think to much about it. Thick and syrupy dessert like beer, very sweet, share with a friend for enjoyment and avoidance of diabetes. Dark amber gold, but big white colored chunks of jel plop into the glass, fairly gross looking. Sweet mildly fruity and coffee aroma and taste, a touch boozy. Medium bodied. Kinda weird overall., Not very stout like. Well they had me at stout with coffee and cocoa nibs. Into a pint glass! A - Well it's a "golden stout" for sure not quite positive if that puts it in the same category. A very dark brown color clear with a 1/4 inch of foam that settles rather quick. S - Cold pressed coffee mostly hard to pick up any cocoa nib or hops. Does smell rather sweet. T - Very strange mix of hops and coffee flavors could be the addition of the coffee berry or Cascara. Not super distracting but has a very weird herbal taste. M - Very smooth despite this one being 11%. Very medium bodied and slick. 12oz bottle poured into a tulip. Pours a glowing deep golden; creamy off-white head that fades leaving nice retention and little lacing. The aromas have hints of chocolate, caramel, coffee, hazelnut and vanilla. Everything is balanced. Malts are there. The flavors are pretty bold. Lots of chocolate up front along with some coffee. More hazelnut in the mix. Roasted characteristics are there. Moderate bitterness. Solid malt backbone. Subtle alcohol notes in the finish, but it's not hot or boozy at all. Mouthfeel is full-bodied with moderate carbonation. It's very fluffy, creamy, smooth and dangerously drinkable. This is a nice "golden stout". It's well executed. The cacao nibs shine and the coffee does its thing. It's enjoyable and fun to drink. Well done. It's worth checking out if you come across it. 12 ounce bottle into tulip glass; no bottle dating, but is a recent release. Pours slightly hazy medium orange/amber color with a small fairly dense off white head with decent retention, that reduces to a minimal spotty lace cap that lingers. Minimal lacing on the glass, with a fair amount of streaming carbonation. Aromas of big nutty dark roast coffee, milk/dark chocolate, cocoa, honey, caramel, vanilla, cream, and toasted biscuit; with lighter notes of apricot, cherry, golden raisin, herbal, grass, pepper, and yeast earthiness. Touch of booze in the aromas as it warms, but not overwhelming. Nice aromas with good balance and complexity of coffee, cocoa, cascara tea, bready malt, and light earthy hop notes; with great strength. Taste of big nutty dark roast coffee, milk/dark chocolate, cocoa, honey, caramel, vanilla, cream, and toasted biscuit; with lighter notes of apricot, cherry, golden raisin, herbal, grass, pepper, and yeast earthiness. Light herbal, grassy, peppery hop; and roasted coffee bitterness on the finish. Lingering notes of nutty dark roast coffee, milk/dark chocolate, cocoa, honey, caramel, vanilla, cream, toasted biscuit, apricot, cherry, golden raisin, herbal, grass, pepper, and yeast earthiness on the finish for a while. Very nice complexity, robustness, and balance of coffee, cocoa, cascara tea, bready malt, and light earthy hop flavors; with a great roast/hop bitter/sweet balance; and no cloying/acrid/astringent flavors after the finish. Lightly increasing dryness from lingering bitter/roast bitterness and spicy alcohol. Light-medium carbonation and fairly full body; with a very smooth, creamy/bready/grainy, and lightly slick/sticky/chalky mouthfeel that is nice. Lightly increasing warmth of 11.1%, with minimal booziness lingering after the finish. Overall this is a very nice golden imperial stout. All around nice complexity, robustness, and balance of coffee, cocoa, cascara tea, bready malt, and light earthy hop flavors; very smooth and dangerously easy to sip on for the big ABV, with the mellowly bitter/drying finish. Haven't had many of this "style" before, but this is one of the better ones I can recall. Great balance of fruity/nutty coffee, cocoa, cascara tea, and bready malts; with balancing bitterness against sweetness. A very enjoyable and well made offering. 23 from Weyerbacher Brewing Co.